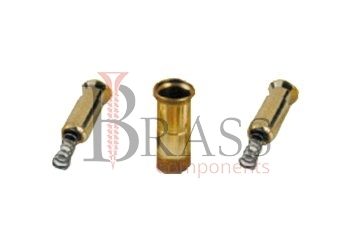 Spring Anchors are made from Carbon Steel, Stainless Steel, Free Cutting Brass, Leaded Brass, 301 Stainless Steel or Aluminium which are passivated and tested to ASTM and other International Standards. They are available in any metric or imperial sizes as per Custom Specification. Offer a convenient and easy means of mount and adjust springs. Quickest, Most Efficient and Economical way to secure the ends of an extension spring. Adjustable, Rugged and Easy to use. Available in Different mounting style including Fixed Hole, Swivel Hole, Single Groove and Multiple Groove. Thick Wall Spring steel, guaranteed grip in the drill hole. Available with different coating and plating which provide corrosion resistance. Designed for high strength and longevity. Available with Standard Threaded Hole Spring Anchors which offer either a mounting hole or groove for the extension spring to attach. Efficient and Productive assembly system. Help to facilitate extension spring fastening and adjustment. Allow to adjust and fine tune extension spring loads. For all common non-structural fasteners. We manufacture Spring Anchors as per Custom Specification and export in Germany, Spain, Netherlands, Portugal, UK and other European Countries. For more Information, Please Contact Us or Inquiry Now.